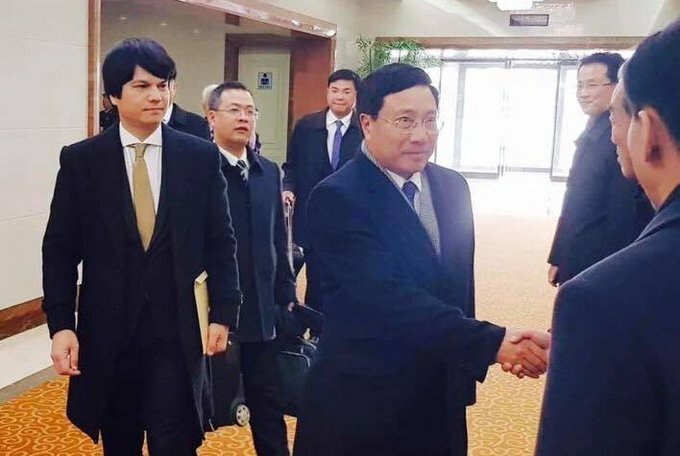 A photo shared on Vietnam's Foreign Minister Pham Binh Minh's Twitter page shows him shaking hands with a North Korean official upon arriving in Pyongyang on February 12, 2019. Vietnam’s foreign minister Pham Binh Minh is on a three-day visit to North Korea from February 12 to 14, the foreign ministry said. This visit comes ahead of this month’s planned summit between U.S. President Donald Trump and North Korean leader Kim Jong Un in Hanoi. Trump said last week he would hold his second meeting with Kim in the Vietnamese capital on February 27 and 28. Prime Minister Nguyen Xuan Phuc on Monday ordered "thorough" preparations for the event. Minh's visit comes shortly after his counterpart Ri Yong-ho visited Hanoi in late November, where both sides agreed to develop bilateral relations and Vietnam offered to share its development experience with North Korea. Vietnam's economic reform is being highly considered as a suitable model for North Korea, given the countries' shared historical and politcal background.